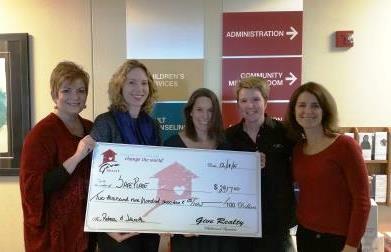 donated on behalf of GIVE Realty and our clients. In Texas, of course we do everything bigger. But there is a movement afoot to do exactly the opposite. A few weeks ago, the tiny house movement rolled into Austin when the National Tiny Home Jamboree took over the Rodeo Austin Fairgrounds. With two days of industry speakers plus a trade show and over 50 homes to tour filled the grounds all weekend. I feel fortunate that Amity and I visited during the Industry days before the crowds of over 40,000 descended. Even though it was hot, hot, hot – it was also a treat to see the amazing spaces that the builders have crafted. Tiny Homes come in many sizes and styles – from converted school buses to the larger park models with no wheels, designed to be parked in a stationary location such as RV Parks or Tiny Home “Villages”. Everything we saw (and we toured ALL of them!) used all the latest finishes and design styles that realtors see in typical new construction of larger homes. We saw cottage chic with barn doors and shiplap. We saw mid-century modern with slick finishes and crazy colors. We saw rustic with cedar walls, bunk beds and fanciful rooflines. And we saw traditional with full sized appliances and front porches. The thing that really sets all tiny homes apart is the ingenuity of making small spaces liveable and the focus on building community. The idea of clearing one’s life of too much stuff is appealing in itself, but the clever ways to make use of limited space offers ideas that we can use no matter what size house we choose. For me, the best thing about this movement is its potential for building new kinds of communities. We met many builders and developers with projects in Belize, Colorado, North Carolina, California and Texas. All of them have a focus on affordability, community engagement and sustainability. Unfortunately, the rules and regulations still have a long way to go to meet the exploding demand of Tiny Home owners. Associations of enthusiasts, builders and hopefully city planners are forming with the goal of creating standard building codes and ways to adjust those codes to tiny homes without losing any safety considerations. Stay tuned!! We will be following this movement closely! Our clients recently sold their home and chose Aids Services of Austin, Capital Area Food Bank and Austin Habitat for Humanity as donation recipients. 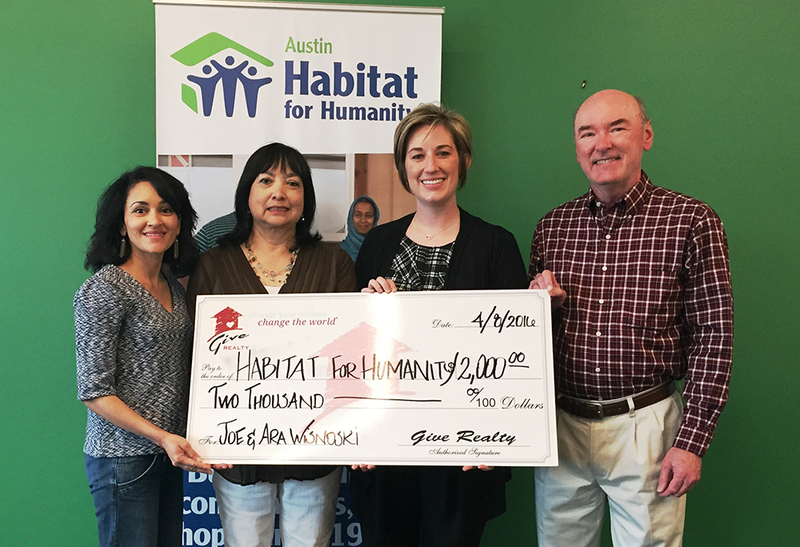 Always a pleasure to give to such worthy organizations that are making Austin a better place to live! Here’s photos from two of the three donations. Congratulations Victoria on another happy client. Rebecca Pokluda and Jeanette Hutchinson donated a total of $8,751.00 to SafePlace, LifeWorks, and The Care Communities. Together, these three nonprofits work to make Austin a safer and more supportive community at-large. That’s $2,917.00 to each nonprofit! As the Austin real estate market continues to grow and the city continues to feel the growing pains, one topic that resonates with many Austinites is “missing middle” housing. Missing middle housing fills the gap between single family homes and apartment homes. It could supply a housing option for many Austinites whose incomes have not kept up with the increase in housing prices. For Austin to be compact and connected, the city needs more affordable housing options for renters and buyers to be built near employers. One very viable option is the addition of Accessory Dwelling Units (ADUs) also known as granny flats or garage apartments. This option is great for renters that want to live in a neighborhood, but aren’t interested in a large single family home. Having an additional rental income also helps homeowners offset rising property taxes. Duplexes, triplexes and fourplexes are other great urban infill options, but are in limited supply in Austin. Building multiple units on one lot lowers the cost basis and could create more affordable housing in central Austin. In a city where over half the population rents, we are severely limited in our affordable rental options. The lack of missing middle housing is greatly contributing to sprawl, which in turn is exacerbating the major traffic problems in our wonderful city. 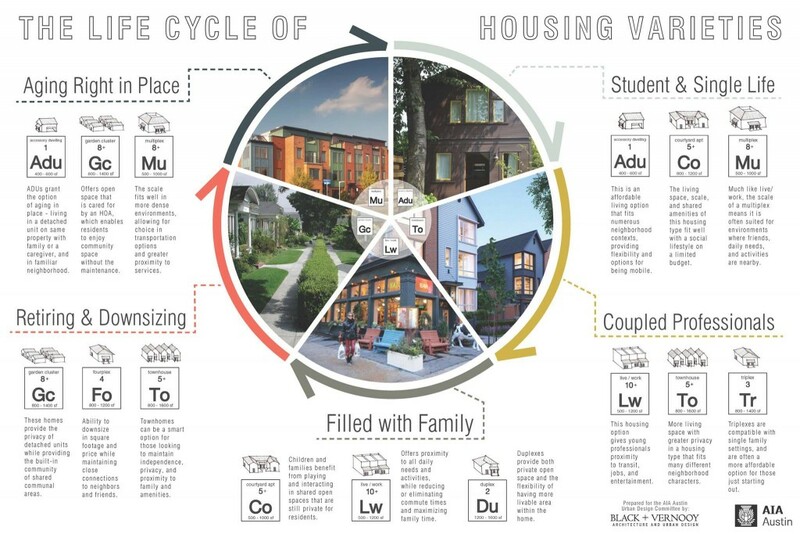 The Missing Middle – Affordable Housing for Middle Income Families in the City of Austin – This Urban Land Institute report identifies the challenges that inhibit development of “middle housing” and provides recommendations to key community stakeholders moving forward. Coding for a Compact and Connected Austin – See what the City of Austin is doing to address urban sprawl. 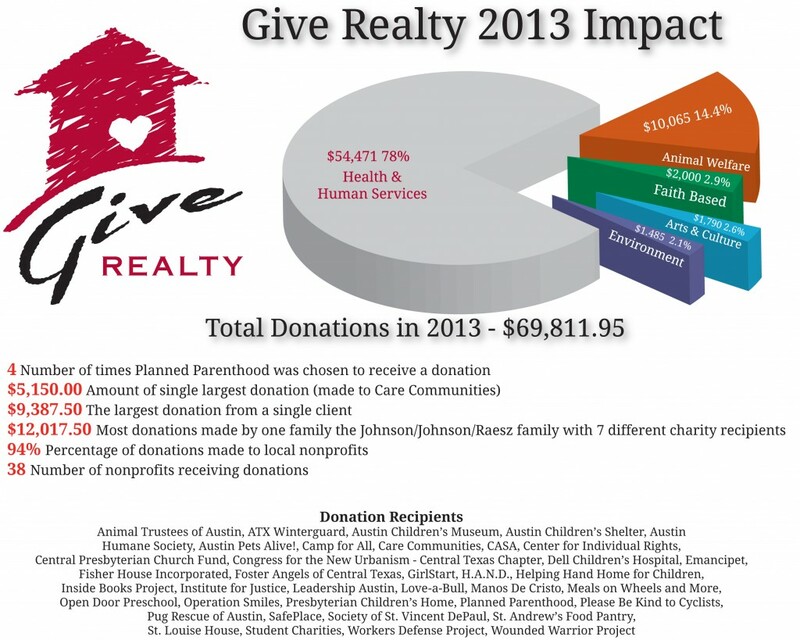 Give Realty in the Austin Statesman! 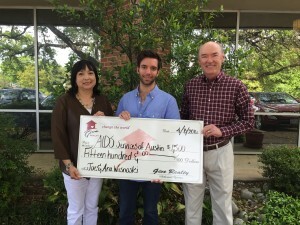 Give Realty was recently featured in the Austin-American Statesman! 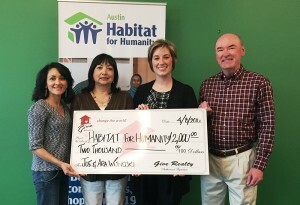 The article highlighted our efforts to give back to the Austin community, and ended with a quote from founder Laurie Loew: “It’s not just about profitability; it’s about what you can give back to the community.” Click below to read the full article! I may be a little late to the game but I’ve just discovered that Airbnb rocks! My family and I were traveling on an extended vacation this summer and our home was going to sit empty. We decided to list it on Airbnb to make a little money to offset the cost of our holiday abroad. We were able to rent our home and with that money pay for an apartment in Denmark for two weeks. It wasn’t our first time renting a home in another country but this was definitely the easiest way. We rented a home last year in France through another vacation rental site but the experience wasn’t nearly as seamless. Not only was renting easy but listing on Airbnb is a cinch! It only took about half an hour and we had our home booked within a couple of weeks. Austin is a very desirable destination but it is also saturated with vacation rentals. You’ll have a better chance of renting your home if you follow a few key rules. 1. Make sure your house is uncluttered. Nobody can picture themselves living in someone else’s mess. 2. Turn on the lights or take photos during the daylight. A clean, bright house looks inviting. Also, remember to take a lot of pictures. We didn’t consider any houses with less than 6 pictures. 3. Make a big deal out of your local amenities. If you live near cool cafes or awesome local shops make sure to let your potential renters know. Renters want to know what the neighborhood has to offer. 4. Highlight upgrades or specials details about your home. A swimming pool or an amazing yard can go a long way in making your home stand out. 5. Make sure your calendar is up to date and respond to inquiries in a timely manner with a polite tone. Make sure you answer potential renter’s questions so that everything is settled before they book. 6. Work on getting great reviews by treating your guests well. Have an extra clean house with some special touches like a few breakfast items for their first morning and maybe some travel sized toiletries. Also, remember to leave a house manual for your guests so they know how to live in your space. When renting on Airbnb there are also a few things to note. 1. Airbnb is trying to create a personal experience so you’ll want to contact the host before booking. They suggest telling them a little about yourself and your travel companions. 2. You may need to contact a lot of hosts before you get a response. We found that only about 70% of our requests received a response. Of those 70%, we got quite a few rejections. It seemed that calendars weren’t always up to date. So even though the calendar showed availability the properties weren’t really available for rent during our desired period. 3. Expect fees such as a cleaning fee which is clearly noted and look closely at cancellation policies as they differ for each property. 4. Make sure you search for homes within your comfort zone of “closeness.” For example, because we have a child, we were not interested in renting a room or sharing a home with someone. We wanted an entire apartment all to ourselves. 5. Read the reviews! They are there for a reason and really help narrow down the many, many listings. There are also a few practical matters that you need to address when posting your home on Airbnb. It is important to look at local rules. For example, in Austin, you must see if your home requires a Short Term Rental License. The City of Austin website (http://www.austintexas.gov/str) states that “Owners of Short-Term Rentals (STRs) in Austin are required to obtain an operating license by City Council resolution (Ordinance No. 20130926-144). Sometimes called a vacation rental, the City of Austin defines an STR as the rental of a residential unit or accessory building for less than 30 consecutive days.” The City of Austin has an entire page dedicated to helping you make sure you’re in compliance with the city’s rules. You should also take a close look at your insurance policy and make sure that you’re covered if you’re using your home as short term rental. The whole process of hosting guests and being a guest in someone else’s home is a bit bizarre but it stretches our travel budget enough that I think we can get used to it. It is an odd sensation knowing that perfect strangers are currently sleeping in my bed and even stranger to show up at someone’s flat on the other side of the world. It took us a couple of days to acclimate but once we kicked our jet lag and found the coffee pot we were set. It’s been a crazy beginning to 2014! Homes are selling at a faster pace than I have ever experienced in the past 9 years as a Realtor®. There have been some very hard lessons learned for both buyers and sellers during this time, so I thought I would share them. Be prepared for multiple offers and selling prices at 5-10% over asking price. Regardless if a home has been pre-inspected, hire a licensed inspector to inspect it for you. Make sure to have a static test done on the plumbing if: 1) You are purchasing a home built before 1970, 2) It has a slab foundation or 3) It has had foundation work (regardless of year built). Always have septic systems checked out and make sure you (and your agent) understand the requirements of transferring the license for that system. Realize that very few (if any) repairs will be done. Be prepared to walk away if the repairs are extensive or expensive. There is nothing worse than being house poor, and a lender may not loan you money on a home that needs major work. ALWAYS get pre-approved before you start looking at homes and use a local lender with in-house underwriting. If the home does not appraise for purchase price, you may have to come up with cold hard cash to make up the difference in the appraisal value vs. purchase price. If your home is not priced right it will take longer to sell. In this market, a home that doesn’t sell in a matter of days raises red flags to a buyer. Make sure your listing agent takes PROFESSIONAL photos. First impressions are important and it will pay off in the long run. If you are staying in the Austin area, investigate the area you want to move to and realize you may need to live in temporary housing for a while because of this crazy market. It’s smart to list the property in MLS. This way you will attract ALL the buyers that are interested vs. the few buyers who saw the “coming soon” sign. 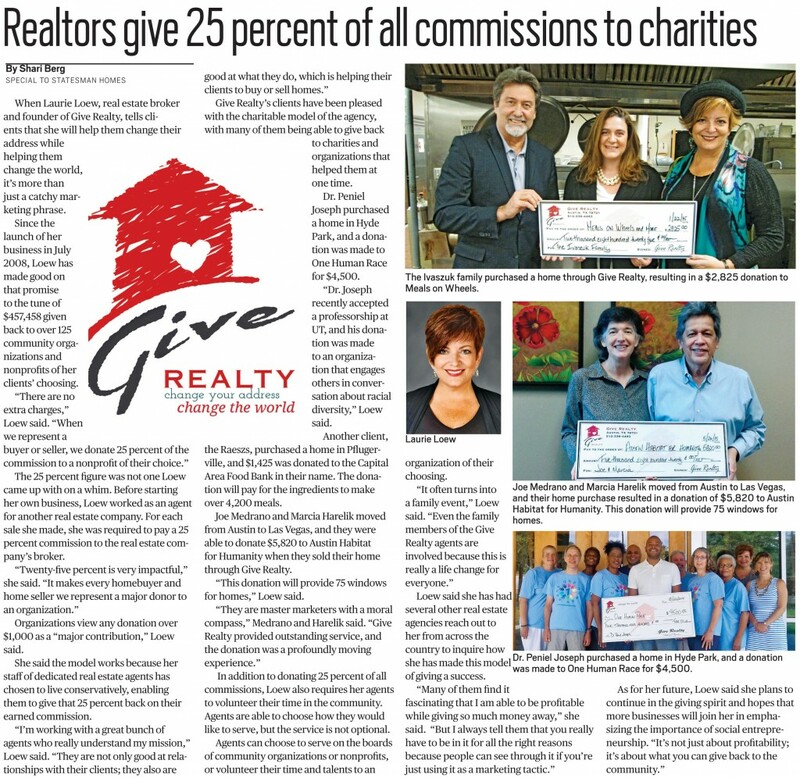 When you buy or sell a home, 25% of Give Realty’s commission is donated to the 501(c)3 nonprofit or faith based organization of the client’s choice. How much impact could the sale or purchase of YOUR home have? Change you address. Change the World tagline is a registered trademark of Give Realty.